Why can’t we stop fighting about evolution and creationism? As I put the final touches on my new book about American creationism, one obvious but counterintuitive point keeps presenting itself: Creationists love science and want their kids to learn evolutionary theory. So why the endless battle? This morning at Heterodox Academy, Musa Al-Gharbi makes some points about culture-war confrontation that help explain the problem. We all love science, we just hate each other. Why? Intelligent, informed, sophisticated people are more likely to be committed to ideas and ideologies. They are more experienced at the kinds of mental gymnastics that can help justify and rationalize seemingly illogical positions. Could these suggestions help creationists and non-creationists talk to each other more productively? Consider a few obvious points. First of all, it may seem like a tired old idea to SAGLRROILYBYGTH, but some people out there still don’t get it. Creationists aren’t anti-science. Not even the most extreme sorts of young-earth creationists are. As we’ve seen in these pages, young-earth creationists spend millions of dollars to give their creation museums the look, feel, and intellectual heft of mainstream science museums. And, as trenchant critics Bill and Sue Trollinger point out, the Creation Museum doesn’t oppose science. To the contrary, the creationists at Answers In Genesis took pains to create something that looks like a “cutting-edge, state-of-the-art natural history museum.” In Kentucky, at least, radical creationists might not agree with me about the definition of good science, but they definitely love science itself. We don’t have to agree with creationism to do a better job of understanding it. Even when it comes to the science of mainstream evolutionary theory, creationists and non-creationists agree on big questions. Here at ILYBYGTH, we’ve heard from creationist homeschool moms who read Richard Dawkins to help teach their kids about evolution. And we’ve noticed ardent Texas creationists who want schoolkids to read the latest evolutionary science. If we all want the same things—though maybe for different reasons—why do we keep fighting about evolution? At least in part, we non-creationists need to take a good hard look in the mirror and see if we’ve been following Al-Gharbi’s advice. Have we tried to lower the perceived stakes of our conflict? Have we tried to really understand creationism and creationists? And have we spoken civilly and humbly to our creationist neighbors? Too often, the answer is an angry no. Consider just a few of the most famous examples. Our most famous evolution mavens tend to speak angrily and ignorantly about creationism. They tend to do what they can to increase the stakes of our disagreements. It’s hard to imagine a better way to raise the perceived stakes in our creation/evolution disagreements than to insult all creationists and promise that evolutionary theory will lead them to atheism. As we’ve seen, though, creationists love science. It’s the unbelievers they’re chary about. What’s the takeaway here? When it comes to our creation/evolution battles, those of us who want more and better evolution education will be wise to avoid these sorts of unnecessary and unhelpful blunders. We should work hard to understand creationism better. We should try to build on our vast areas of agreement instead of focusing on the things we won’t agree about. And we should avoid preaching to our own choir with gratuitous and inaccurate insults of our creationist neighbors and friends. I know, I know, it has been hard to sleep for the last couple days. With the cliff-hanger ending of my last guest post about evangelical colleges at Righting America at the Creation Museum, I’m sure it has been difficult to wait for the sequel. 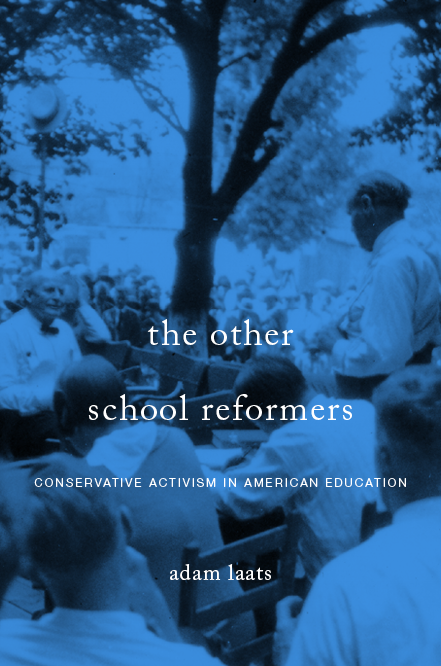 Well, wait no longer: Today at RACM you can read the second half of my argument about the way evangelical higher education influenced the career of American creationism. What Goes on at Creationist Colleges? Thanks to Bill and Sue Trollinger, the wizards behind Righting America at the Creation Museum, I’ve had a chance to share a few of my ideas about the vital role played by higher education in the evolution of American creationism. Evolution has always been forbidden fruit, but not always in the same ways. This cartoon came from Biola University’s student paper, c. 1939. This morning RACM has kindly published the first half of my argument about the tangled and troubled history of creationism at America’s evangelical and fundamentalist colleges and institutes. As you might suspect, even though fundamentalists all agreed that evolution was bad, they didn’t agree on much more than that. Check out the full two-part argument at Righting America at the Creation Museum. Penn students and some of Wax’s colleagues condemn her. What does any of this have to do with school reform? The ILYBYGTH take. Love means never having to say you’re sorry: Trump pardons Sheriff Joe Arpaio. At The Gospel Coalition, an open letter from Christian scholars denouncing racism. Are white evangelicals more racist than Christian? Mark Labberton of Fuller Seminary says yes but they can change. Finding racism among white evangelicals is not the full answer to the question but rather only the first answer. White American evangelicals—as a group but not necessarily as individuals—have always tended to be prone to the same racist assumptions as white American non-evangelicals. But so have African American evangelicals. And the question of racism is only a symptom of the fact that white American evangelicals have often put their American-ness and their white-ness above their evangelical-ness. Consider the cases of Randy Beckum and the tradition of love-it-or-leave-it patriotism at evangelical colleges. The problem with “privilege.” Jeffrey K. Mann wants us to look beyond race and gender. What happened to all the Christian bookstores? Yes, you read it correctly: Reese Witherspoon will be playing the role of a defector from the “God-Hates-Fags” Westboro Baptist Church. Where are all the sinister atheists who are trying to undermine Christian America? The Trollingers couldn’t find them at the American Atheists Convention, from Righting America at the Creation Museum. Family sues NYC schools over their son’s “gender expansive” preference for dresses. The school accused the parents of sexual abuse. Vouchers and stealth vouchers: The Progressive offers a guide to the wild and woolly world of public-school funding options. What should conservative evangelicals think about gender and sexuality? Not every conservative pundit does. Matthew Lee Anderson won’t sign. Some progressive evangelicals have offered a counter-statement. Only in New York: A Brooklyn school principal accused of recruiting her students into the communist movement. Should I stay or should I go? Trump’s evangelical advisors split on splitting. Update from Arizona: Federal judge rules that the ban on ethnic studies program was racially discriminatory. Should you red-shirt your kindergartener? They liked him then, they like him now: White evangelicals oppose calls to impeach Trump by big margins. How can you get Ken Ham and Jerry Coyne to agree? Talk about the similarities between abortion and infanticide. Don’t like Trump? Is it because, deep down, you know he is you? John Burtka IV argues that Trump IS America. What do atheists think of creationists? The Trollingers speak at the American Atheist Convention, from Righting America at the Creation Museum. Looks like Liberty University has some ‘splainin to do. Disclosures suggest Trey Falwell owns a “gay-friendly flophouse with an on-site liquor store” in Miami. Zoiks. What’s Missing from this Creationist School? Is young-earth creationism an inward-looking fortress? …or a missionary outpost? News from Kentucky is pushing your humble editor in a new direction. Here’s the latest: Ken Ham’s Answers In Genesis (AIG) organization is partnering with Renewanation (it’s easier to read when you cut it into three: Renew-A-Nation) to open a new creationist school near the Creation Museum. Students will get free family passes to the museums. Teachers will be able to use the museum as a teaching aid. So far, so obvious. But the announcement adds new fuel to an old debate about young-earth creationism. Is it meant to be a form of evangelical outreach? Or is it rather just a way to circle fundamentalist wagons? preaches mostly to those who are already converted, and its effect is more to sustain the beliefs of the converted than to change other peoples’ convictions. In the end, it is all about protecting the children. On the other hand, the language of young-earth creationism is full of missionary talk. The reason dinosaurs are such a powerful creationist weapon, Ken Ham likes to say, is because they are “missionary lizards.” The goal of his ministry, Ham insists, is to reach as many benighted people as possible with the saving gospel of Genesis. As I wrestle with this question for my new book about American creationism, I’ve tended to think that we need to take Ham’s missionary talk at face value. [Our new school] wants to help curb the trend of young people walking away from the church by equipping them—from kindergarten through their senior year—with apologetics, using logic and critical-thinking skills. AIG’s partner, Renewanation, promises to inculcate a biblical worldview that will give students everything they need to resist the intellectual and spiritual trends of modern America. The “myths” blasted by the Renewanation folks are much more closely focused on the insular community of young-earth creationists. They don’t seem interested in reaching non-creationists with their message. Rather, they mostly want to convince the converted that their school is the only way to keep their children safe. What are the most prevalent “myths” the Renewanators want to debunk? Christian schools are too expensive. They don’t have good sports programs. They aren’t really necessary, just optional. In every case, Renewanation clearly targeted the already converted. Their argument is not about missionary fervor; it is about safety and protection for the already convinced. Most remarkably, the notion of young-earth creationism itself was not a huge part of the appeal. Rather, the goal of this new school—and of the Renewation school network as a whole—is to provide an insular educational setting in which young-earth creationist students can learn to remain young-earth creationists, no matter what. The goal is not (only) to teach young-earth creationism. Rather, it is to teach young-earth creationists. And, of course, there is no reason why YEC can’t be both an insular fortress and a missionary outpost. The fortress protects the missionaries as they do their work. This school announcement, though, certainly seems to be more about the “protecting” part than the “outreach” part.